Backup data on a faster hard disk with a monstrous capacity — Samsung Spinpoint 640 GB internal hard drive. The Samsung internal hard drive has a 7,200-rpm rotational speed, which boosts reading from and writing to the hard drive. 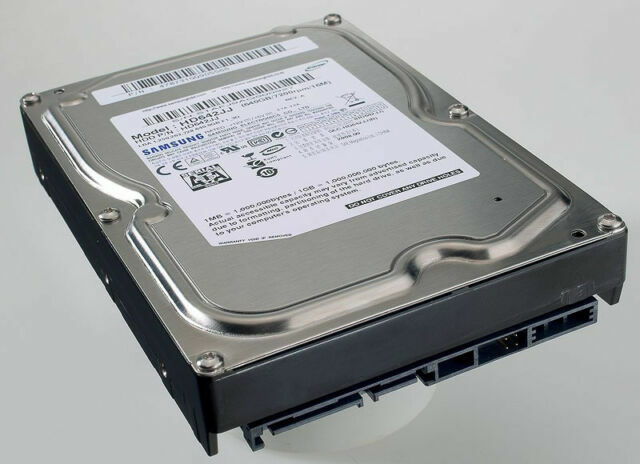 This 640 GB Samsung hard drive boots your OS faster, and loads applications much quicker. The Samsung Spinpoint 640 GB internal hard drive’s ample cache memory, and shorter average seek time make for faster data transfers along with reduced power consumption, and generating lesser noise and vibrations. Connecting via a SATA port, this Samsung internal hard drive provides a very high data transfer rate. The Samsung hard drive can be installed in both — Windows-based, or Apple Macintosh desktops as well as demanding servers. As ssd is the way to go, this is still cheaper, 2 set up in a raid 0 work just fine. And I keep everything backed up so a hdd failure losing everything is fixable. I plugged it in as a 2nd hard drive for my XPS 8300 and it has worked fine. Excellent hard drive, I really recomend it.